If you are one of those people who find the idea of a relaxing beach holiday akin to torture – you probably won’t be putting Turks & Caicos islands at the top of your vacation destination list. However, you would be missing out if you neglected to explore the possibilities of heading in the direction of this beautiful, sun drenched British Overseas Territory, sited in the Atlantic Ocean – because you would find plenty of activities on offer to get your adrenalin pumping. So let go of all your pre-conceived notions about Turks & Caicos being the islands that adrenaline forgot and read on to discover the numerous ways you can get your pulse racing in paradise. Whilst it is undeniable, a relaxing beach holiday is why most people head for these shores, even the most lazy holiday-maker needs to inject a frisson of excitement into their daily routine of sunbathing and paddling. Water based activities are where it’s at on these islands. With the clearest crystal waters to splash about in, you may find yourself in the sea more often than on land. One of the most exciting experiences to plug into is one which gets you close up and personal with some of the magnificent marine life in the area. For deep sea fishing Turks & Caicos Islands are the perfect place to be introduced to creatures such as Monster Wahoo, Blue Marlins, Dorado and Tuna. On well equipped vessels with experienced crew who know the best waters for the biggest catches, a day deep sea fishing Turks & Caicos Islands style will live long in the memory. Another sea based activity that will have excitement levels peaking in the red zone is scuba diving. The waters around Turks and Caicos are like something out of the popular animation Finding Nemo. The huge range of marine life available to be viewed is awe-inspiring, including Rays, Turtles and starfish just for starters. The many reefs that surround these isles are habitat for vast range of sea creatures and you can see new and wonderful things on each dive. 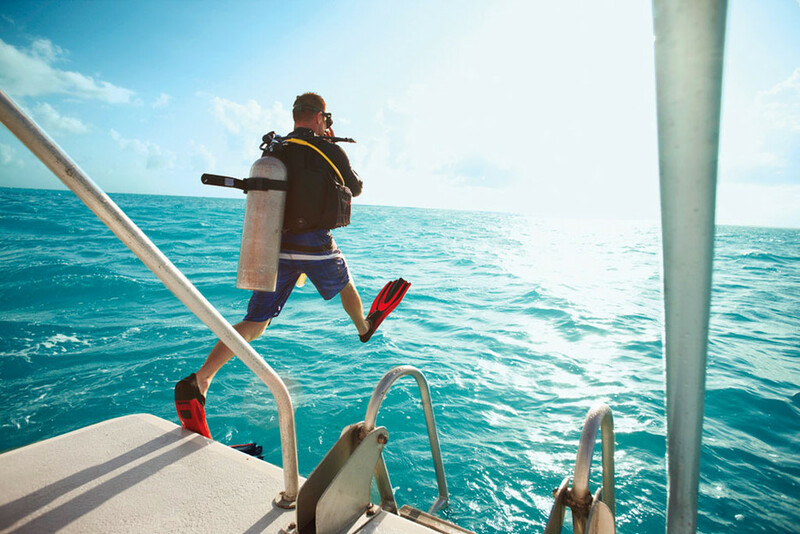 As well as scuba diving, which takes a certain amount of training, expertise and equipment, it is also possible to have a perfectly brilliant time with just a snorkel, mask and flippers. If staring a barracuda or giant stingray in the face is your idea of holiday heaven, re-consider a trip to Turks and Caicos. What else is there to stir the interest of the excitement addict? Well, because the islands are very much geared towards protecting the natural environment for all the incredible sea life, loud noisy water sports such as water ski-ing and jet skiing is quite hard to come by as they are considered disturbing to the underwater creatures. Water skiing, tubing and wake boarding are available, you’ll just need to search harder and it will probably be right out in the deep ocean where the impact on wildlife is minimised. Why not try something just as exciting but quieter? Powered only by the natural elements, Kite boarding across the turquoise waters of the islands is something that’s becoming more and more popular amongst energy sports fanatics. With near perfect conditions of shallow waters and consistent trade winds, kite boarding is a fast and furious sport that any adrenaline nut will fall for hook, line and sinker. Stand up paddle boarding might at first sound a little too sedate– however, it is one of the most exciting ways to explore the many uninhabited isles and inlets of Turks & Caicos. Get your intrepid head on and seek out inland waterways,hidden turquoise lagoons and secret paradise isles, all from the perfect viewing point of a stand up paddle board. If shooting up in the sky at great speed and looking down on the beach below is your idea of fun, book yourself in for some parasailing. Nothing beats that rush of blood as the wind sweeps you up and carries you along, high above the sands and sea. Finally, nothing rivals the excitement of seeing the majestic whale at close quarters. If you visit the islands during their spring or autumn migrations, you could see humpback whales cutting through the ocean. To make the most of this natural, wildlife highlight, take a whale watching boat trip or view from Salt Cay or Grand Turk as they pass in the distance. So you see, Turks and Caicos isn’t a sleepy island kingdom with nothing to keep the adrenaline junkie happy. There are plenty of activities to keep the most action-fixated holiday makers busy for their whole vacation. Feeling just a little bit tempted?